The fundamental elements of the architecture of Jerusalem are proper to the constitution of the city’s urban fabric, but, ultimately, they are archetypal forms of geometry, spatial devices found throughout the history and distribution of architecture. The architecture of Jerusalem combines disparate architectural elements brought by various civilizations from abroad with local elements found in situ. Through time, certain architectural attributes, originally found locally, returned to Jerusalem as imported architectural techniques. 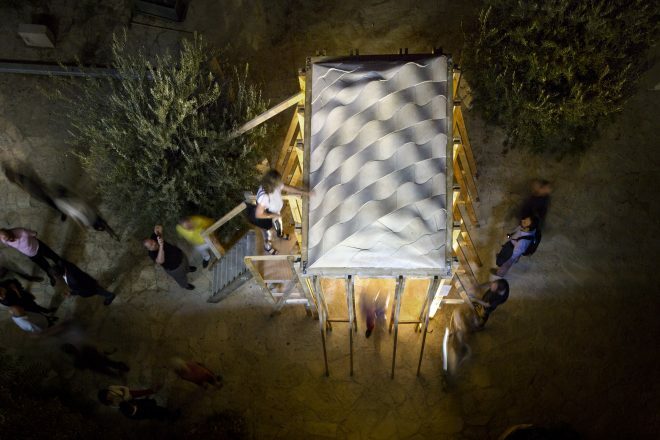 Analogy addresses the reoccurrence of stone-made forms and spatial configurations in Jerusalem through time. Analogy explores the inherent qualities of architectural fundamental elements (including vaults, lintels, and columns) towards finding novels ways of expressing each. Analogy is part of “Stone Matters,” an ongoing research into the potentials for including structural stone in the language of contemporary architecture and for combining traditional craftsmanship and materials with innovative construction techniques. 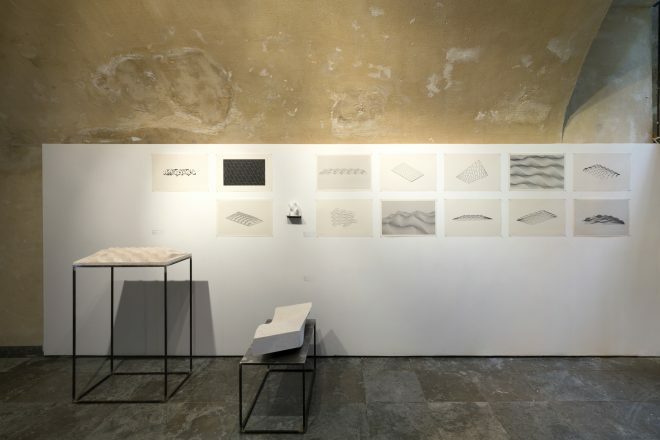 For the Biennial, the first experiment of Analogy presents a vault inspired by a typology used in Islamic architecture at least since the thirteenth-century (Mamluks) and continuously employed – in different specific configurations – in the palaces of the Renaissance, as well as in common houses during the Ottoman period. This ‘aqd takaneh usually rises on four walls and covers a rectangular (as opposed to square) space. Arches extend up on all four sides so that in the inside, creating, at the highest point, a flat horizontal center. In the Renaissance palaces, painted frescoes decorated the central flat part. 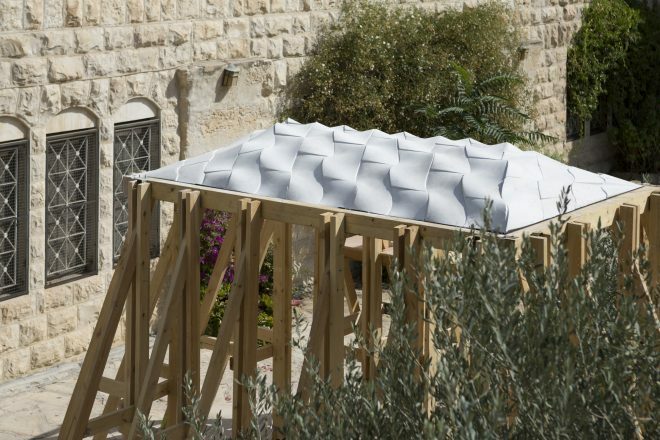 The focus for the Biennale on the ‘aqd takaneh – widespread in domestic Palestinian architecture during the Ottoman period – deliberately desacralizes the use of stone, too often associated exclusively with noble constructions. Towards creating a vocabulary of stone use in contemporary architecture, we propose an architectural language both adapted to modern programmatic needs and integrated into a common architectural lexicon. 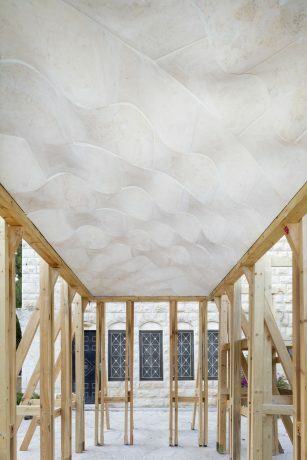 The ‘aqd takaneh presented in the Lutheran school in Jerusalem consists of stone voussoirs that reciprocally hold each other relying on stereotomy, inspired by several lintels and vaults found in Jerusalem. 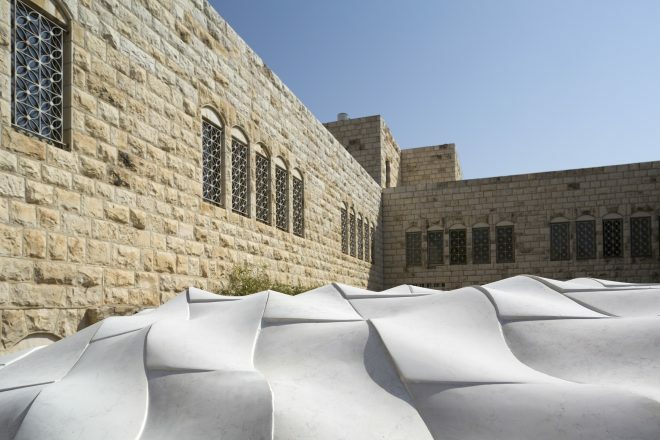 The undulating geometry is defined by shifting sinusoid-shaped profiles forming doubly-curved, ruled surfaces of interfaces between stones allowing for the structural reciprocity. Fuchs, “The Palestinian Arab House and the Islamic “Primitive Hut””. Ways of cutting elements of stones in order to assemble them in a larger configuration.